Pencott School, a familiar sight for most of us here on the Operation Orphan Team. The school is made from a few buildings built in close succession in an ‘L’ shape around what they use as their playing field. Other buildings very close by are rented by teachers at the school, a great way of helping them cut their cost of travel to work! Included in one of these people is the Head Teacher, Peace, who lives a stone’s throw away from the school. Five buildings make up the school in total which includes the toilet block. The first building is a very simple oblong shape with corrugated iron apex roofing and contains 4 class rooms, this is the biggest building by far. They also have a building with a second storey capability so expansion can be possible upwards too! This building will, when finished, be comprised of more classrooms for the children offering potential for growth and attracting more fee paying students to the school. Next to this is the building that houses the kitchen, head office and a smaller classroom. 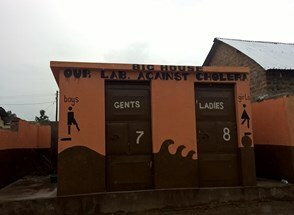 Next to this is the toilet blocks, these are built near to or over huge septic tanks which are sunk into the ground, these toilets help to provide a much higher level of sanitation and avoid outbreaks of diseases like cholera which can be devastating. The buildings are very well made and all classrooms have large chalkboards installed for the teachers to use, all of the buildings have flooring installed and secure windows to allow light without compromising on security. 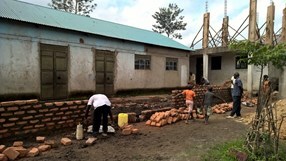 The school’s original building is nearing completion thanks to the efforts and the generosity of the countless givers here in the UK. It is finally having a much needed veranda built which will afford the children an outdoor space with protection from the tropical rain storms. 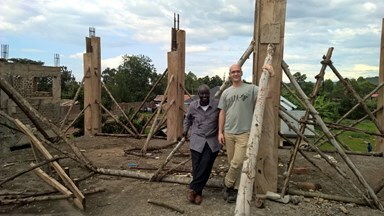 During our recent visit we had the privilege of being involved in the building project. As we arrived on site the work had already begun. Workers were mixing cement and laying it into trenches created for the foundations of the veranda which we were finally adding to the original school building. There were piles of bricks used previously to make pillars which had been knocked down and these bricks were going to be used to create a short wall structure which would become the boundary of the veranda. These bricks needed cleaning off since they had lots of old mortar stuck to them and after talking with Andrew who was the site foreman it became clear that these bricks were currently all the bricks we had until the new bricks arrived. This being Africa and timings being what they are in Africa we decided to help by cleaning the bricks ready for when they would be needed. Sure enough the foundation layer of concrete was laid long before the new bricks arrived and so the majority of the old bricks had already been used on the wall as intended. They had been ready and prepared by the time they were needed thanks to the forward thinking and extra help that Jess and I had provided. Without this little bit of help the project would have slowed to a stop for good few hours while the bricks were cleaned off. 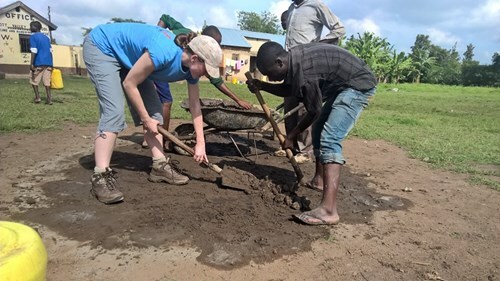 Another thing that seemed to work was that the presence of Jess and myself helped to galvanise some of the children of the school who all helped do the little they could. 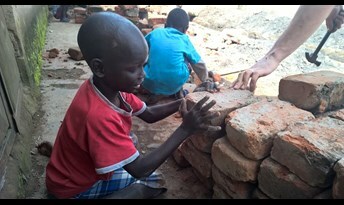 Children as young as 4 years old came to help us each lifting one brick and carrying them to where the bricks were needed, stocking up the bricklayers so that they could continue their work more efficiently. Some children showed a natural talent and interest in the work they were getting involved with and tried their hand at some brick laying. It was a great opportunity to show our support in more than just the giving of money, during this trip we got a chance to teach the children, give money and join with them in their hard work! Thank you to all who have supported this brilliant school. the impact that this school has within it’s community is real and massive and it isn’t possible without all of you!